Preheat oven to 410° F (210° C / Th 7). Get water to a boil in a saucepan. Brush bread slices with olive oil (3 tablespoons) and bake in oven for 5 minutes on each side. When water is boiling, add eggs carefully. (I usually put the egg in a tablespoon, it’s much easier to get it gently to the bottom of the saucepan). Leave them in boiling water for 4 minutes. When they’re done rinse them with cold water and leave aside. Heat a frying pan over medium heat and add bacon slices. Cook for 3 minutes on each side, or until bacon looks crispy. When bacon is done, leave it in a plate covered with a napkin to drain its fat. Dice bread and cut bacon into pieces. Squeeze lemon in a bowl and whisk mustard, 3 tablespoons of olive oil, salt and pepper with it. In 4 plates, arrange corn salad, bacon and bread pieces. Serve on top lemon sauce. Carefully remove egg shells and place a soft cooked egg on top of each plate. Break it for the egg yolk to flow. Find more easy French recipes on http://frenchcookingfordummies.com. 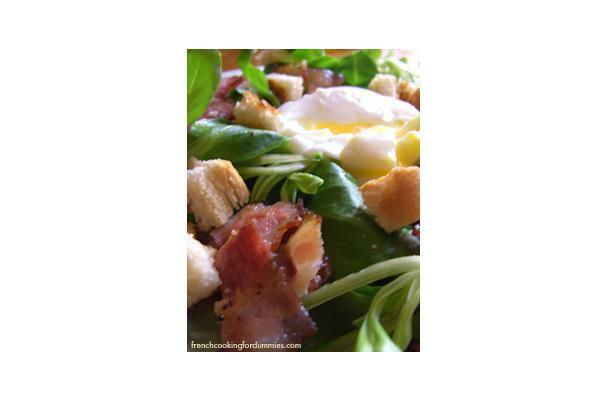 Great salad to bring for a potluck, or recipe to make for Labor Day or Fourth of July.